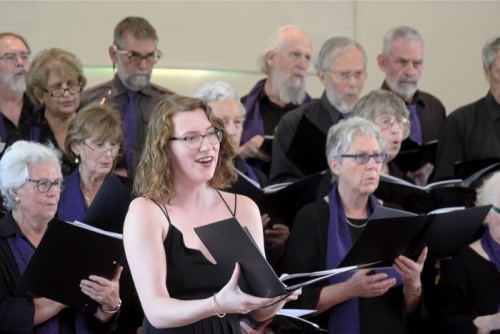 AS AJ America is to further her music career in Sydney next year, she led the Canberra Community Chorale for the last time as musical director in an eclectic and enthusiastic concert at North Belconnen Uniting Church on Sunday, December 3. The soft and subtle sounds of Arvo Pärt’s “An den Wassern zu Babel sa Ben wir und weinten” (At the waters of Babel we sat and wept) Psalm 137 opened the concert. The chorale was joined by soprano Veronica Milroy and soprano Emma Griffiths, with Lucas Allerton on piano and conducting AJ America. Pärt’s haunting music was composed using just three vowels, i, e and o which were repeated throughout the piece as the piano led the melody line. It was a surreal experience. Norwegian composer Kim Arnè Arnesen’s “Song of Sea Exile” and “The Song of Love” came next. Milroy opened with Allerton on piano before the full chorale came in. The style of composition didn’t show a lot of depth or originality. They were simple songs with modest but overly sweet melodies, though both were performed well. What followed next, which was Canberra composer Clare Maclean’s setting of Oodgeroo Nunuccal’s poem “Hope”, showed a flair and freshness. The words to the poem were layered across the chorale and the sopranos, this created a diverse texture of sounds in this pleasing song. Beginning with soprano Milroy, and doing a great job at an Irish accent, “Mo Ghile Mear” (My Gallant Hero) a traditional Irish song was sung and played with great enthusiasm and style. Allerton not only played the piano but also the bodhrán, which is a hand-held drum. It contained several vocal effects that made the piece stand out. An unprogrammed piece followed with Allerton on piano. It was by a Japanese composer for a video game. This tonal melodic work showed just how good so much video game music is today. Next came Liszt’s “Transcendental Etude No 4”. Allerton let the audience know what they were in for with this overpowering work. Fiendishly difficult and played with immense vigour and volume, Allerton let it rip. He performed with such dynamic that at one point a tuning fork someone left on the piano jumped up and bounced onto the floor. Paul Stanhope’s beautifully composed music to a traditional Palestinian song of peace “Ya rabal salaam/Shalom Aleichem” had a strength and a delicacy that powered with emotion. The singing of soprano Griffiths added much life to the song. Heinrich Schütz’s “An den Wassern zu Babel” bookended the concert with excellent singing by the chorale in what is a slightly difficult work. The polyphonic nature of the piece has many pleasing and intriguing aspects throughout and wound up this diverse concert beautifully. Canberra will sorely miss AJ America’s many talents and her sublime voice, but she will be back at times to lead the Luminescence Children’s Choir and other local musical activities.